Integrate your flock into a healthy growing system that is self-supporting. When I picked out my first, fluffy chicks from the local feed-supply store, I assumed—like most new chicken keepers—that the main reward would be fresh, backyard eggs. After 5 years of incorporating poultry into my suburban homestead, I now know that the benefits of keeping chickens go far beyond that delicious breakfast scramble. Chickens, perhaps more than any other animal, can help the thoughtful gardener create systems of bounty through their natural behaviors: scratching, pecking, hunting bugs, eating and manuring. As such, they are the ideal livestock companion for small- or large-scale permaculture design. Permaculture is an ecological design method that allows you to get more from your garden or landscape with less work and less resource use. Using permaculture techniques, a gardener can design a space which is bountiful and productive without requiring hours of ongoing labor or applications of toxic pesticides or chemical fertilizers. Chickens have functions far beyond just eggs, and by properly harnessing the natural behaviors of our feathered friends, we can create productive systems that expand our bounty and enjoyment for our flock. Jessi Bloom, bestselling author of Free Range Chicken Gardens (Timber Press, 2012) and Practical Permaculture (Timber Press, 2015), says the key to successfully incorporating chickens into a thriving edible landscape is to first consider the needs and behaviors of your chickens. “If we look at the natural behaviors of the chicken, and how it survives in the wild, it’s not dependent on us to feed it or house it or protect it,” Bloom says. “Chickens have survived in the wild as jungle birds for thousands of years. So if we look at where the chicken would thrive naturally, we can design habitat that’s as natural for the chickens as much as possible. 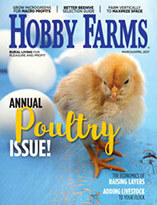 Wheaton advocates for pastured poultry paddocks as the healthiest way to maintain a flock of chickens. In this system, multiple areas of diverse pasture are grown, and the chicken flock is rotated through each area in turn. As the vegetation and insect population of one paddock is eaten down, the flock is shifted on to the next paddock and the first paddock is allowed to recover. Bloom cautions that a pasture-based system is dependent on living in an area with abundant rainfall and so is not universally appropriate. In contrast, she says, nearly every region can support appropriate food forest plants. The takeaway for the average chicken keeper looking to maintain a happier, healthier flock of chickens in accordance with permaculture principles and with far fewer inputs is that there isn’t one ideal system. All permaculture design starts with careful observation. An honest assessment of your land, climate, time and personality is the first step to designing an optimum productive system using chickens. Urban gardeners may find it impossible to work either a free-range food forest or lush paddock shift design into their property, but this doesn’t mean small space properties can’t benefit from chickens, too. The key to working naturally with chickens on a small or urban lot is to consider the carrying capacity of the land you have available. Bloom emphasizes that contrary to what many chicken fanciers feel, it’s possible to simply have too many birds. I’ve learned the hard way that chickens left to their own devices can quickly destroy a lovingly tended vegetable garden. In my own productive yard, my chickens are kept in a coop and generous run with supervised free-range time and lots of garden and kitchen scraps. However, because I am limiting the natural behavior of my chickens by containing them, it becomes my responsibility to take on the extra work and extra expense of bringing food and greenery to the birds, and hauling manure from the coop and run to other areas of the garden. In an optimum permaculture system, the birds would be in charge of finding their own food and distributing their own manure. The more you limit the natural behavior of your flock, the more effort it will take on your part to keep their environment healthy. 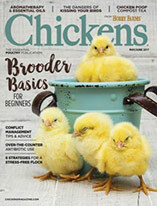 Bloom offers a few essential tips for small-space gardeners who want to incorporate chickens successfully into their edible landscape. Fence before it’s too late! They say good fences make good neighbors, but good fences also make good chicken keepers. If you want to keep your free-range flock from pooping all over your patio or eating all your vegetable starts, you’ll need to fence them away from these areas. When in doubt, fence higher than you think you’ll need. Net highly desirable plants. Chances are good that if you like to eat it, your chickens will, too. Bird netting will protect blueberries, cherry tomatoes, cherries and other highly desirable garden treats, helping to ensure you get some of the harvest, too. Try part-time ranging. Your birds don’t have to be 100-percent free-range. Supervised or limited-time free-range is better than none. It gives your flock access to a more diverse landscape and allows the birds access to pests in your garden. Try letting your flock out into your yard an hour or so before dusk. Their natural roosting instinct will bring them back to the coop. If the birds behave well and your land responds well, slowly increase the amount of time you allow the flock out. Train your chickens! Teach your birds to come when you call them with food rewards, such as scratch, mealworms or black oil sunflower seeds. Chickens are easily trainable, and with consistency, you will be able to call them into secure areas or away from forbidden zones. Work with the seasons. Use a chicken tractor or temporary fencing to allow your chickens into areas that need soil prep before spring planting or garden clean-up work in the fall. In her book, Bloom offers the following guidelines for selecting a sustainable flock size. Keep in mind that the carrying capacity of your property can vary greatly based on your climate, the footprint of your home, how much supplemental feed you offer and what other features you want in your yard. 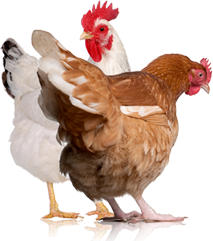 A small urban lot, less than 7,000 square feet, can generally support three to five hens. Smaller spaces call for smaller flocks, and Bloom recommends bantam chickens for those who are very space limited. At this size property, fully free-ranging your flock is difficult. Coop and run, paddocks or tractoring are more realistic. A suburban lot, approximately 7,000 to 13,000 square feet, can generally support a flock of five to eight birds. If your neighborhood allows it—at this size, most won’t—this is the smallest size flock you would want to support a rooster along with your hens. A large suburban or rural lot, more than 13,000 square feet, can support eight to 12 chickens or more. As your acreage increases, it becomes easier to successfully free-range or full-time pasture your birds. Permaculture favors ethical systems that can maintain themselves or regenerate. 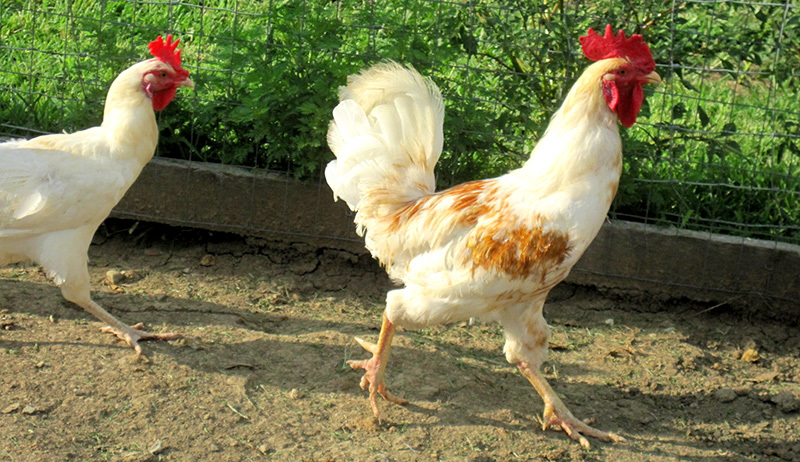 In order to have a truly self-sustaining chicken flock, you need roosters. Larger flocks of birds have a more calm and stable social order if one rooster is included for every five to 10 hens. A good rooster will also aggressively defend his ladies from predators and threats. Finally, raising your own replacement birds may be a more ethical practice than supporting industrial hatcheries that supply chicks. Bloom recommends Rhode Island Reds as one of her favorite breeds for inclusion in a permaculture system. They are hardy, good foragers and adapt well to a free-range environment. She also likes Barred Rocks and Buff Orpingtons, particularly for families with children. Chickens are way more than just cute little egg machines. They are the ideal animal for the beginning permaculturalist who wants to start incorporating animals into their food production system. Manage your flock properly, and you’ll harness greater productivity and diverse yields with far less work. Erica Strauss is the founder of Northwest Edible Life, one of the most popular and well-respected urban homesteading and gardening blogs in the country. A professionally trained chef, she shares her fun and punchy perspective on garden-to-table eating and living a slow-ish life though her writings. Erica was featured in Best Food Writing 2013 and regularly writes for national cooking and gardening magazines. Her new book, The Hands on Home: A Seasonal Guide to Cooking, Preserving & Natural Homekeeping, was released in 2015.